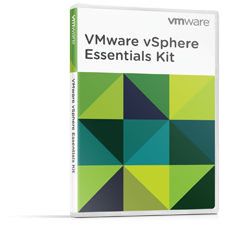 VMware vSphere Essentials Kit delivers the industry-leading virtualization platform for small businesses at an affordable price. Small businesses can virtualize their physical servers and centrally manage these servers, reducing hardware costs and increasing operating efficiency with a low upfront investment. This kit includes 6 CPU licenses of vSphere Essentials (for 3 servers with up to 2 processors each) and 1 license for vCenter Server Essentials. The vSphere Essentials Kit licenses are perpetual and do not have an end date. The support term includes updates and new releases of the selected product during the time frame selected. VMware vSphere Essentials Plus Kit (Term License) provides an all-in-one solution for small businesses to virtualize their physical servers and reduce hardware costs while ensuring superior high application availability and data protection. Term license offers an additional option for customers with smaller IT budgets. The price includes the product license and Basic (or Production) support & subscription for 1 year. The licenses are valid for the length of the term (1 Year). VMware vSphere Essentials Kit (Term License) delivers the industry-leading virtualization platform for small businesses at an affordable price. Small businesses can virtualize their physical servers and centrally manage these servers, reducing hardware costs and increasing operating efficiency with a low upfront investment. Term license offers an additional option for customers with smaller IT budgets. The price includes the product license valid for 1 year. VMware Per Incident Support is sold separately.